Last spring, Nikki Beckett vanished, sucked into an underworld known as the Everneath. Now she’s returned–to her old life, her family, her boyfriend–before she’s banished back to the underworld . . . this time forever. She has six months before the Everneath comes to claim her, six months for good-byes she can’t find the words for, six months to find redemption, if it exists. Nikki longs to spend these precious months forgetting the Everneath and trying to reconnect with her boyfriend, Jack, the person most devastated by her disappearance–and the one person she loves more than anything. But there’s just one problem: Cole, the smoldering immortal who enticed her to the Everneath in the first place, has followed Nikki home. Cole wants to take over the throne in the underworld and is convinced Nikki is the key to making it happen. And he’ll do whatever it takes to bring her back, this time as his queen. ERMAHGOSH! That was…..BREATHTAKINGLY UNEXPECTEDLY AMAZINGLY AWESOMELY EPIC! Okay, now the capital letters are over and done with, let’s get in with the review. That cover… :O Just totally captured me the second I saw it and it for once, didn’t disappoint. In fact, it knocked me off my feet. I really love how we cannot see Nikki (I’m assuming it’s her) as then, we wouldn’t be able to imagine ourselves as what Nikki’s features would look like. Moreover, the red dress looks awe-inspiring against the hues of grey. LOVE LOVE LOVE! Another grand reason for reading this was it’s blurb. Hello?! It’s GREEK MYTHOLOGY! (Okay…I liiied about the no capital letters.) I fell in love with Greek Mythology fiction books after Rick Riordan’s impressive books. The Everneath. History books call it the Underworld. Or even hell. But I know it’s neither. It is really called the Everneath, and it’s not a place for the dead. It’s a place for the Everliving-beings who have discovered the secret to eternal life. It’s a place for Forfeits- the humans who give up everything to nourish the Everliving. It’s the world caught between this one and the next, a layer between Earth and hell. I know because I was a Forfeit. I would give anything to change this. Nikki has finally come out from Everneath from technically speaking, 100 years. However, she came back, un-aged and in one piece. Because she survived it. She survived it for one person, she may have forgotten the name, but she always remembered the face, for 100 years. Brodi Ashton is too amazing for words, I do not know where I’ve been this whole time, turning back to yesterday, I know feel like I totally missed out on something big, so too big for words to speak it. Now, I so overwhelmed in shock of this book that I spent at least and hour just staring at the book. The romance in this book is oh SO good. Normally, I expected a love triangle from just the synopsis but I was mistaken, no love triangle. PHEW! Nikki and Jack are phenomenal and I simply got heart broken at the end. 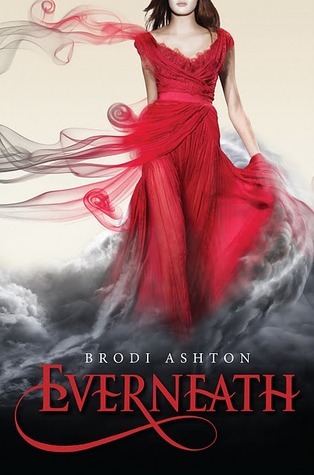 Overall, I loved Everneath, it is not just a Persephone and Hades retelling, it’s actually a different myth telling that, in a way has an Egyptian twist to it. Anyone who fell in love with Rick Riordan’s work that thought that there should have been more romance and less action should look out for this book as it will satisfy them fully.